On 11-14 December 2004, Pugwash workshop no. 303 was held in Kathmandu, Nepal. Following a terrorist attack on the Indian Parliament in December 2001, diplomatic relations between India and Pakistan were suspended and both countries maintained a military standoff for over a year. After more than five decades of acrimonious relations between the two neighbours, where the lives of millions of people were imperilled by three wars and several near-war situations, India and Pakistan in April 2003 committed themselves to fresh rounds of talks with the aim of constructing a bilateral composite dialogue where the conflict over Kashmir would be addressed. 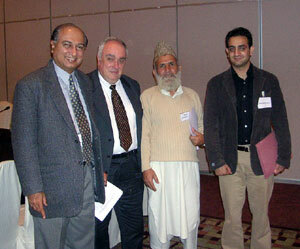 The Pugwash workshop on ‘Jammu & Kashmir and the India-Pakistan Dialogue: The Prospects Ahead’ was the most recent in a series of Pugwash workshops on South Asia issues, held in Lahore, Geneva and New Delhi in 2002-2003, focusing on the need for and ways of strengthening a normalization process between India and Pakistan. Although Jammu and Kashmir is certainly one of the most contentious issues between the two countries, it had not been discussed in detail during previous sessions, except for issues of cross-border infiltration and the management of the Line of Control as seen from the perspective of India’s and Pakistan’s national security concerns. It was felt that the participation of key Kashmiri actors from both sides of the divide was paramount in evolving mechanisms of sustainable and rewarding conflict resolution. For the first time in decades, members of political parties, non-governmental organizations, and civil society from both sides of the Line of Control were able to meet with each other, and with their colleagues from Pakistan and India, for constructive dialogue. More than 50 participants from India, Pakistan, Azad Jammu and Kashmir (Pakistan Administered Kashmir- PAK) and from all regions of Jammu and Kashmir (Indian Administered Kashmir – IAK) attended. [ No representatives from Kashmir’s Gilgit and Skardu regions (the Northern Areas – NAs) attended]. The Pugwash Conferences are very grateful to the governments of India and Pakistan for helping to facilitate the meeting, to the government of Nepal for agreeing to host the meeting on its territory, and to the Carnegie Corporation of New York for its support of the Pugwash South Asia program which made the meeting possible. The Pugwash Secretary General, Prof. Paolo Cotta-Ramusino, and all the members of the Pugwash community would especially like to pay tribute to Mr. J.N. Dixit, the national security advisor to the government of India, who did so much to help make the meeting a reality, and who passed away on 3 January 2005, shortly after the meeting. The workshop then concluded by re-convening in a plenary. What follows is a general summary of the main points covered in the meeting, with the report being the responsibility of the rapporteur, and not meant to convey or imply approval by any particular participant, or the group as a whole. The stated positions of all parties to the Kashmir dispute are well known. After a brief introduction of the standard Pugwash methodology for meetings – where individuals represent only themselves and where there should be no attribution of remarks made during the meeting – the organizers urged participants at this historic meeting, intended at creating a framework for dialogue between people from India, Pakistan and from both sides of the Kashmir divide, to go beyond acrimony and stated positions and creatively reflect on their own capacity in contributing to peace and reconciliation in the region. Although no consensus was reached in identifying the starting point for evolving conflict resolution mechanisms, all participants acknowledged that the human dimension of the conflict should take priority over geo-strategic considerations. Key approaches were developed by some participants, stressing the need for ‘change’ mainly in developing a people-centred approach and making the human dimension of the Kashmir problem part and parcel of the political dialogue at all levels. Some participants also felt that ‘time’ is a fundamental factor in establishing a durable peace between India and Pakistan, but most importantly for the whole of Kashmir in its regional environment. What is needed is a prolonged period of non-violence, coupled with genuine social and economic reforms, that could deflate a great number of problems and help establish a durable and sustainable peace. One cannot expect a society to shift instantly from profound trauma to peace. Genuine space should be carved out for the people of Kashmir to recover from 56 years of estrangement and alienation, and from over a decade and a half of intense violence. At the outset, there seemed to be much agreement that the UN Resolutions proposing a plebiscite to express the political choices of Kashmiris, of acceding to either India or Pakistan, was now obsolete. It was also generally agreed that the end result of negotiations on the future political status of Kashmir cannot be realistically ascertained at this stage. Nevertheless, initial negotiations can and should focus on the Kashmiri people’s prime interest in peace, reconciliation, and economic and social development. While there remain dissenting views on who exactly are the representatives of the Kashmiri people (and in fact no party or individual can claim an absolute representative character), the over-riding consideration is that the Kashmiri people need to be represented meaningfully at different levels of negotiation. The need for developing a multi-level approach was generally agreed to by the participants, stressing the need for an intra-Kashmiri dialogue and process of reconciliation within both sides of Kashmir and across the Line of Control; and between Kashmiris and both capitals. To that end, while participants appreciated the efforts of both India and Pakistan to sustain a composite dialogue, it was nonetheless emphasised that the bilateral process should arrive at Kashmiri-specific CBMs. This multi-track dialogue should be a means rather than an end; it should result in formulating CBMs that should in turn be implemented by all parties concerned within a particular timeframe. Most importantly, CBMs related to Kashmir – whether emanating from the bilateral or the multi-track dialogue process – must provide people of the State with palpable dividends. It was also underlined that while the Indian and Pakistani governments have set up a framework for a political route that could lead to a more secure environment and perhaps to peace, a number of measures can safely be taken without embarrassing either government or making either of them dramatically change their historical position. Meanwhile, measures such as opening roads and enhancing trade relations would substantially improve people’s lives. The heterogeneous character of J&K must of course be taken into consideration. Over 56 years of history, there have been no opportunities for developing social, economic or political cohesion within Jammu and Kashmir, either across the LoC or within the respective units of Indian Administered Kashmir and Pakistan Administered Kashmir. Today, each region of J&K tends to be specific rather than inclusive about its own vision and demands. In the context of a multi-track dialogue, it will be important to keep ground realities in focus while simultaneously recognizing at the outset the common link of geographical contiguity as a basis for more fluid relations among them. One should also recognize that the question of quality leadership is essential in evolving people-centred policies and giving the Kashmiris their due place in a negotiating process. All parties, mainstream or separatist, must emphasize their commitment to genuinely benefiting the people and staying away from political manoeuvring by India or by Pakistan. A high sense of responsibility and morality must prevail in claiming a representative role on behalf of the Kashmiri people. Moreover, some participants thought that a multi-track dialogue should be inclusive of all parties concerned, to include representatives of the Northern Areas, main stream parties contesting elections in Indian Administered Kashmir, and opposition parties in Pakistan Administered Kashmir. The Pugwash gathering was reminded that over 15 years of violence have profoundly affected people’s psyche, especially in Indian Administered Kashmir, where physical violence has stamped every soul. Kashmiri society ground realities are very different today than fifty or twenty years ago. Violence has crippled all institutions and affected people’s confidence, both with presumed friends and imagined foes. No party concerned can therefore remain insensitive to the fact that reforming a society is quite different than re-constructing a war torn society. It is therefore expected that collective interests will ultimately prevail upon personal ambitions. Secondly the leadership in India, in Pakistan and in each unit of J&K must develop a truly compassionate mind-set that is realistic in vision and pragmatic in deeds while being committed to restoring the right to life, and the right to live, of the Kashmiri people. Beyond wide acknowledgement that there can be no military solution for Kashmir, it was stressed that a prime requirement for sustainable dialogue and resolution of the conflict was the end of violence. The yearning for non-violent interventions on Kashmir territory was strongly emphasized throughout the meeting by most participants, who agreed that all forms of violence should be stopped unconditionally. The gun must be silenced from all sides and all forms of violence – including mental persecution and human rights abuses and violence perpetrated by armed groups – must be halted immediately in all parts of Kashmir. Political will on all sides is essential to this end, especially as the military option seems to still exist in the strategic thinking of some parties. the economy and social institutions, and steps to create the conditions for the rule of law. (4) The dialogue process started in Kathmandu should be continued and institutionalized. The three working groups that met during the Kathmandu conference also came up with general recommendations, as noted below. These recommendations represent general principles discussed by one or more of the working groups, and do not necessarily represent the view of each and every conference participant. All forms of violence should end, irrespective of their form or origin. Oppression and humiliation of Kashmiri people should be stopped. Civil society throughout the state should de-legitimize violence through massive demonstrations. Whereas the ceasefire between Pakistan and India on the LoC is already paying dividends, the cease-fire should be extended within J&K. Proselytizing should be banned; training camps and recruitment networks should be dismantled. All parties and individuals should refrain from statements and actions that incite or promote hatred and violence. No one should assume that all individuals or parties yearn for an end to the conflict. They should be identified and the dialogue process should be extended to them as well. Allowing freedom of political expression in all parts of the State. Releasing political prisoners and prisoners interned without trial for long periods. Allowing and facilitating interaction between all regions of the state, including with the Pandit and other displaced communities. Easing restrictions on travel documents to ensure maximum possible people-to-people contact. Facilitating family reunion across the Line of Control. Building extensive academic, social and cultural contacts between institutions across the Line of Control. Above all, Kashmiris need to contemplate on how to use the political space they would gain by India and Pakistan relieving pressure on them. For there to be a durable peace, India and Pakistan must take adequate measures and encourage the development of a vibrant economy in all the different regions of J&K. Good governance and accountability are key issues that need to be examined in all parts of the State, therefore models of greater political and economic autonomy applied to all parts of the State should be put forward. Notwithstanding the violence that has become associated with Indian Administered Kashmir (IAK), the problem as much as the solution is not confined to the IAK. Important steps have to be taken as well in Pakistan Administered Kashmir and the Northern Areas in order to greatly improve the governance model in these areas of Kashmir and to ensure that people across the state benefit from social and economic reforms. Bus services should be activated linking different parts of the state. Multiple land routes should be opened or constructed within J&K and across the LoC and infrastructure should be developed to link all parts of J&K to the rest of the region. Border markets and meeting points could be set up at possible crossing-points along the LoC, for example at Beelam Valley and at Uri-Chakhoti. Trade in goods and services should be developed across the LoC and at a regional level. Kashmir’s water resources should be the subject of closer studies and in depth discussions, as the State holds a great potential to benefit itself and the whole region. The national media in India and Pakistan as well as local media in J&K and international media have the potential to play a major role in de-escalating tensions, de-legitimizing violence and strengthening peace constituencies in India, in Pakistan and in J&K. Honest and objective reporting, and the discarding of stereotypes and inflammatory rhetoric, could go a long way in rebuilding social bonds in the region. (1) A good deal more social, economic, cultural and political interaction between peoples in different parts of the State would be beneficial in highlighting different sets of issues and viewpoints that are of concern to the inhabitants of J&K, and could lead to the building of new relationships based on common denominator interest in local and regional issues. (2) CBMs should be seen as creating trust from the ground up, and should not be made hostage to progress in other areas of the bilateral composite dialogue between India and Pakistan. At their most effective, CBMs create inter-dependence between a wide range of issues, allowing progress to be made in a number of different spheres. Specific CBMs relating to the Pandit community should also be explored. (3) There should be transparency in the negotiation and dialogue processes between India and Pakistan on the question of J&K. While it goes without saying that the Kashmiri people must be an integral part of the negotiation and dialogue process, it is also true that State leaderships should walk an extra mile to understand and take into account the national and security concerns of India and Pakistan. Finally, all parties concerned should demonstrate their political will and intellectual ability in showing flexibility. Moving away from maximalist positions, all parties concerned must envisage various formulae applicable to J&K which would not necessarily disregard vital interests. Participants welcomed the reduction of security forces in IAK and hoped that a continuation of the process of normalization will lead to further reduction of forces. It was also stressed that basic political freedoms are necessary in Pakistan Administered Kashmir so that no military overt or covert operations can gratuitously hijack the dialogue and peace process by making use of these areas. The cease-fire should be extended and maintained within the State, and should be accompanied by the de-mining of border areas in order to facilitate people-to-people initiatives and the overall strengthening of CBMs. Finally, the role of various intelligence agencies operating in J&K was generally perceived as distorting people’s wishes, creating fear psychosis and working against people’s interests. Such conduct can only undermine the long-term viability of a solution to the J&K issue. 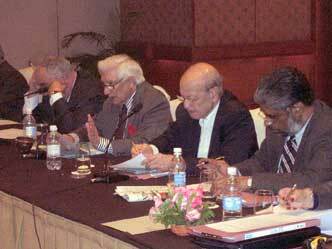 Participants adjourned at the end of the three day-meeting with strong agreement that such dialogue involving all sectors of society from J&K with counterparts from Pakistan and India should continue, and with the Pugwash Conferences promising to seek the resources necessary to convene a follow-up meeting, hopefully in the spring of 2005.